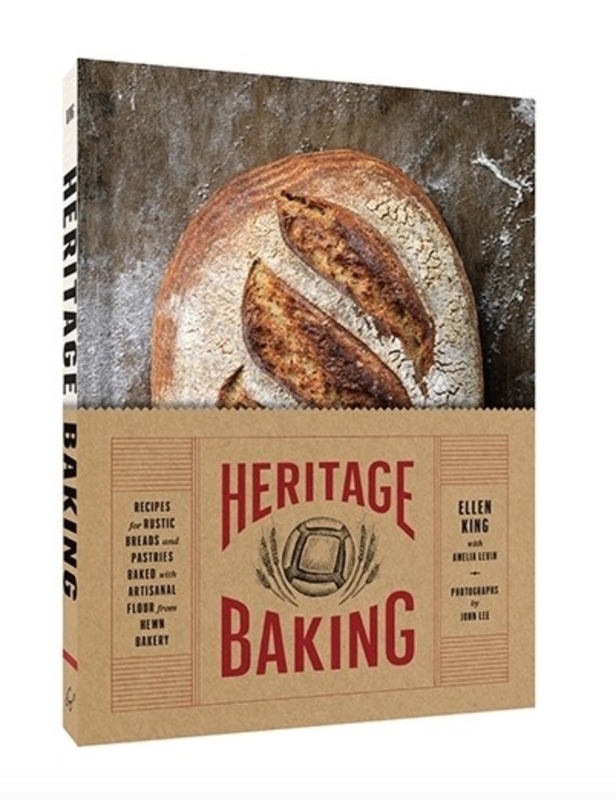 Hewn Bakery co-owner Ellen King holds an advance copy of her book, Heritage Baking. It’s available for pre-orders now, and will be in bookstores on October 23, 2018. We are thrilled to inaugurate our “What’s New!” blog by announcing that baker, local organic grain booster, and historian Ellen King’s first book, Heritage Baking, is now available for pre-orders, and will be in bookstores by the end of October. We first met Ellen when The Mill at Janie’s Farm was still a gleam in farmer Harold Wilken’s eye. 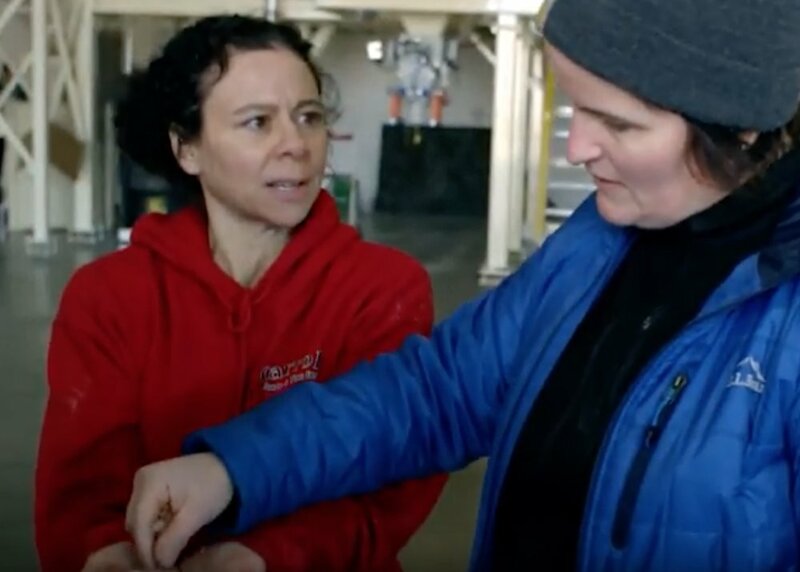 In fact, Ellen came downstate to see the farm and talk with Jill, who would become our head miller, just after we had gone on a fact-finding field trip to Farmer Ground Flour in Trumansburg, New York. It was a very cold day in late winter/early spring, but Ellen brought warmth and joy, along with practical advice and encouragement. Our miller Jill Brockman-Cummings confers with author Ellen King at The Mill at Janie’s Farm. Ever since that first meeting, Ellen has been an important and supportive person as The Mill at Janie’s Farm evolved. She provided us with invaluable feedback during our early attempts to grind grains into quality flours at different extraction rates. The truth is that she is in large part responsible to getting us to where we are today: providing consistent, high-quality, organic, stone-ground flours to home bakers and professionals alike. This book is the opposite of a buzzkill — with bread and pastry recipes that run the gamut from a basic Heritage Country Loaf to a Cinnamon Roll Brioche to a Sourdough Tart Cherry Coffee Cake. These great recipes by Ellen are accompanied by gorgeous photographs by John Lee, and lots of background information about grains and flour by Ellen and her co-writer Amelia Levin. In fact, we are so jazzed about this book, that I’m sure we’ll have future blog entries about it. We couldn’t agree more, and are honored to be part of the “grain chain” that, like this book, brings delicious, wholesome joy into your life. Thank you for visiting our website. We look forward to serving you!